Inspiration from the new book “The Artist’s Journey” by Nancy Hillis continues to move me to the studio each day. See Nancy’s new book on Amazon HERE. Kentucky State Capital Building, Teacher Unity, standing with my friend and fellow Franklin County Teacher Kristy Standifer. 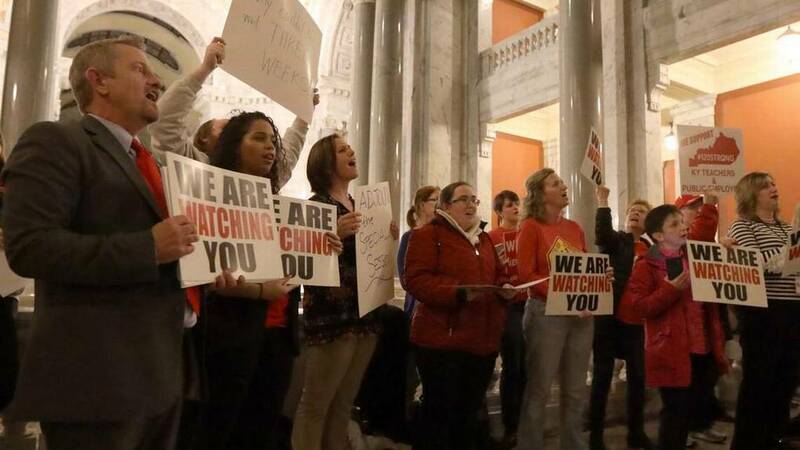 This week Kentucky Teachers stood together making their voices heard regarding bills in our Legislature affecting the future of Education in Kentucky. I was there at the Capital Building in Kentucky along with five other teachers from my district, Franklin County. Here is a brief synopsis of the issues concerning us at this time as they were developing. Below is a description of the major issues before the legislature that may be of interest to you. Feel free to pass this along. There has been very little movement on bills in the state House of Representatives today, but I wanted to provide some information since many are likely wondering what is going on with this legislative session. This email is not intended to elicit support or opposition, just to inform folks on the policies impacting education that could be passed before the end of the session. There are three items of particular interest to us as educators. The first is the policy change presented in HB 525. This bill proposes to change the makeup of the teachers pension oversight board. The current board is made up of four appointees by the governor and seven members who are elected by active and retired teachers. This bill proposes change the way those seven members of the board are chosen. Under the proposed bill, these seven members will be chosen by the members of six different organizations: KEA (one active, one retired), KY School Board Assoc, Jefferson County Teachers Assoc, KY Assoc of School Adminsitrators, KY Retired Teachers Assoc, and KY Assoc of Professional Educators. The concerns over this change center on the increased representation of administrators on the board, as well as a seat being given to KAPE, an organization that represents roughly 2% of teachers in KY. The second policy deals with the creation of tax credits for those who make donations for private school scholarships. This bill is currently presented in the form of HB 205 and SB 118, but the language of the bill may be added to another bill through amendment. The concern over this bill is that it will reduce tax revenue to the general fund and serve as an equivalency to tuition vouchers, which are specifically forbidden by the state constitution. The legislature has stated a desire to simplify the tax code by eliminating existing tax credits, and this bill would add another credit to the state tax code. The third issue before the legislature that impacts us regards the increased power of superintendents in the selection of principals. There are several different proposals that address this, so the specific bill number is not essential. Under the proposal, final approval of hiring a school principal would be in the hands of the district superintendent, not the SBDM council of that school. If passes this would decrease the voice and influence of teachers and parents in the selection of their principal. I hope this information is helpful to everyone and provides the basics on the issues of concern to us as educators. Tell your legislators to support public education funding and oppose HB 205 and SB 118. Courtesy The Action Network. A tradition at Kirsteinfineart provides support to encourage women to speak their truth and stand up for their convictions. Here is our most recent collection to support teachers in speaking out on today’s major Education issues.